Step 1 - THE OVERALL - Note red notes to myself, and area that is circled. Step 2 - THE SPECIFIC Note items are highlighted out in two colors. My drafter had one color, I had another. I do quite a bit of projects that start without drawings, and need a good base before design starts. 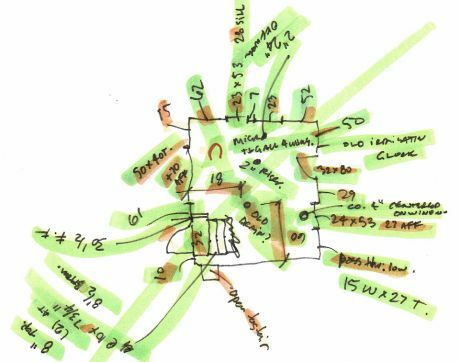 That means going to into the field for a day recording measurements for an entire building, then taking the info back to the office to draw up proportionally in cad. I'm generally accurate within 2". Going back to the jobsite repeatedly is a waste of time and client fee, so getting all the info the first time is important to me. I record all my measurements in inches, no fractions, measured to the wall, not the trim. Feet is always apprebreviated FT.
BEFORE I start, I photograph EVERY room's wall, ceiling, and floor. It helps to have a photo to look back on for misc details. Step 1 - THE OVERALL. 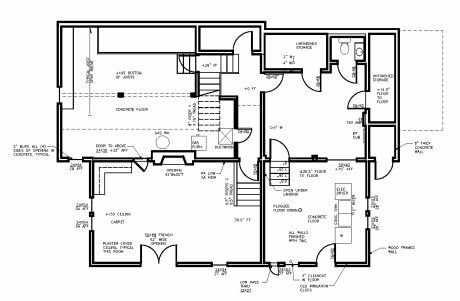 Draw up a sketch of the overall floor level. It can be loose and sketchy with mistakes scribbled out. We're collecting data here, not making art. a. Get some overall dimesions all the way across the building, wherever possible. b. Dimension each room's length and width. c. Get each rooms ceiling height. Step 2 - THE SPECIFIC. 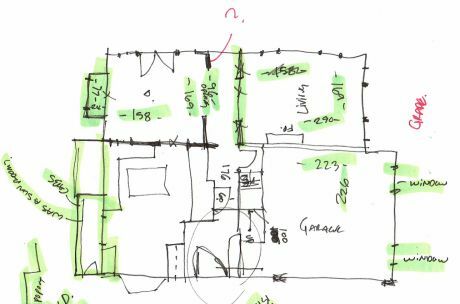 On a new sheet of paper, draw up the perimeter walls of the space or room, and measure each wall segment and door segment. I measure to the inside of interior window jambs and the leaf of each door. Each room gets its own sheet of paper. Step 3 - THE DETAILS. Add misc. details to each room, floor and ceiling registers, outlets, switches. Step 4 - ASSEMBLIES. Measure a couple pieces of trim, siding, the width of door jambs, some sill heights, ceiling and floor tile. Step 5 - ENTERING IN CAD. I start with my overall drawing and get the proportions right, and then fill in the detail. If its within 2", I feel like I'm doing really good. a. as you work, highlight off each dimension that has been entered. If its suspect, circle it in a separate color. After looking around a screen doors, I decided to make my own out of some of the fir framing from my own house remodel. The frames are all glued up with biscuits at the corners - like simple frames. Painted on the outside, clear sealed on the inside. The material is 1" thick to accomodate the narrowest lock mechanism I could find. The screens are stopped in with dainty wood trim held in place using a pin nailer - stretching the screen tight as you go. Excess trimmed off. They survived two years of children pushing on the lower panel before we had to reinstall the screen. Not to bad.